Is it best to price your managed services offerings per device, per user — or using a different model? At Channel Transitions VAR/MSP Executive Conference, powered by Business Solutions, members of the managed services provider (MSP) panel Greg Zolkos, CEO of Atlas Professional Services, Jason Etheridge, president and CEO of Logic Speak, and Tom Clancy, co-founder of Valiant Technology, told which pricing models their companies use and why. Clancy explained why Valiant Technology charges per user: “We were a widget-oriented biller, and we saw two things that changed our focus. One was BYOD and two was the cloud revolution.” Clancy said companies with bring-your-own-device policies could assume because an MSP didn’t provide devices that there wouldn’t be any associated tech support. An employee-owned device, however, could be infected with a virus and introduce it into the network requiring the MSP to remove the virus and make necessary repairs — to the network and to the employee’s device. Also, when clients begin using cloud services they may assume an MSP is not necessary to keep those applications securely and efficiently running. Charging per user eliminates confusion over what the MSP will monitor and maintain. Clancy commented that the type of clients you have can make a difference in how you choose to bill for managed services. For example, users working for your manufacturing clients may only use devices provided on the floor. In this case Clancy suggests billing on a per device basis or have a different product designed for manufacturing. Another example is a client in video production operating render farms. “I can’t charge them on a per server basis, because they do not have traditional servers, and I can’t bill on my normal per-user model, because they have a lot more infrastructure going on,” he explained. Zolkos said because the user-centric model ties in with ConnectWise professional services automation (PSA), record keeping and auditing can be automated. Before automating the process, Zolkos said Atlas spent a lot of time auditing each client’s users and devices, but now, adjustments, such as an employee leaving the company or a user adding a new device, can be entered, and the PSA automatically updates the bill. “All that time and energy we were spending, which was easily ten hours a month at a very high level rate, is gone,” he said. He added that some MSPs could find it a challenge for their employees to accurately determine what it covered under the client’s contract. Etheridge said Logic Speak solved this problem with Autotask IT management and MAXfocus remote monitoring and management (RMM). The users’ devices are logged in the system, and the technician can see the service level agreement (SLA) based on the device. Channel Transitions was held November 5 at the DoubleTree Orlando Airport. For more information on the Channel Transitions VAR/MSP Executive Conference, visit www.ChannelTransitions.com or email Events@BSMinfo.com. 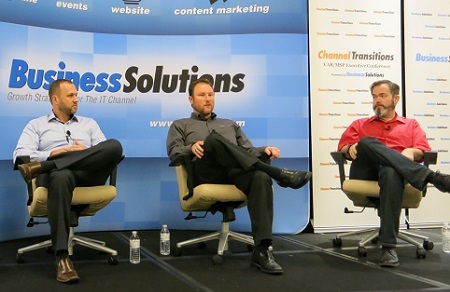 For additional coverage of Channel Transitions conferences, visit http://www.bsminfo.com/solution/inside-channel-transitions.